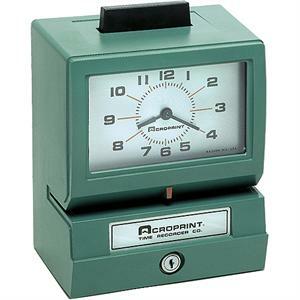 A heavy-duty punch clock such as the Acroprint Model 125 can handle thousands of print registrations per day. These dependable workhorses feature a tough, rust-resistant case that stands up to harsh environments. They're suitable for any size business. Model 125 time clocks are suitable for time and attendance tracking, job costing, time and date recording and many other applications. The Model 125 manual-print time recorder accepts standard time cards. A push bar located on top of clock activates a sturdy spring print mechanism for instant registrations. This model comes with a large, easy-to-read analog clock face. Dependable - designed to provide years of trouble-free service. Carries a lifetime typewheel guarantee, and 1-year warranty for the rest of the materials. Economical - uses widely available standard time cards. Automatic ribbon feed and reverse insures long ribbon life. Durable - withstands harsh environments and thousands of print registrations per day. Versatile - offers a variety of print registrations to meet specific applications. Designed for years of service. The Model 125 features a tough, rust-resistant case that withstands harsh environments. We are so confident in the quality of these clocks, we offer a lifetime typewheel warranty, and a one-year warranty on the rest of the materials. Suitable for most business applications. With a variety of typewheel options, these clocks work for time and attendance, job costing, document tracking and many other business uses. Economical to operate Automatic ribbon feed/reverse ensures maximum ribbon life. The Model 125 prints cleanly on widely-available standard time cards and most other business documents — no specialty cards required. Precise spring-activated printing. A guide mark makes it easy to position your document. Then a quick press of the top push bar instantly activates the sturdy spring mechanism, printing a time registration precisely when and where you want it. Dimensions: 8" x 6" x 10"